Welcome to February, where in Northeast Ohio, it often is our coldest month. With Valentine’s Day in mind, it’s time to rekindle with our beloved, to recount all the reasons that brought you together. What better way to do that than with a couple’s getaway? Couples who take time for just themselves often thrive over couples who don’t. Finding alone time away will make for a happier day to day family life. Only have time for an overnight? How about a nice ride to Wooster, take in an amazing meal at The City Square Steakhouse, followed by a night at The Market Street Inn, where you will wake to a full gourmet breakfast? Looking to get away for a few nights? There are so many options: Vegas, Chicago, New York, Disney …wait, Disney? We all know what makes Disney great for families, but there is so much to see and do for adults, too. The attention to detail, quality and service are legendary, and the company has tailored some great experiences with adults in mind. 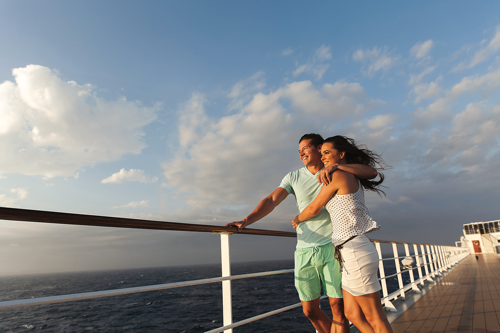 On Disney Cruise Line, one-third of each ship encompasses adult-only spaces. Let loose in the uniquely themed lounges and clubs. Unwind at the coffee bar or splash in the adult pool. There are world class spas offering a range of services, and if you are trying to keep fit, stunning fitness centers onboard each ship. Plus, enjoy an exquisite meal in the adult exclusive restaurant. And if your ship makes a stop at Castaway Cay, Disney’s private island, you’ll delight in Serenity Bay, an adult exclusive beach. Whether you’re a ride person, foodie, people watcher, shopper, or you just want to go at your own pace, you are going to love Walt Disney World. Consider getting the Deluxe Dining plan and enjoy a sit down breakfast and a Signature Dining experience every night. Do your shopping and pool time during the day and enjoy all of the parks at night during Extra Magic Hours, when most of the families have cleared out and the rides have little to no wait. Take in Disney Springs, a center filled with restaurants, entertainment and shopping, with brands like Alex & Ani, Columbia, Kate Spade and Lilly Pulitzer, just to name a few. Don’t miss the multiple celebrity chef restaurants. For the ultimate couple’s experience, consider these special times. At Epcot’s International Food & Wine Festival, more than 30 countries are represented with a signature small dish and drink — letting you eat and drink your way around the world. Epcot’s Flower & Garden Festival is bursting with dazzling gardens, fresh flavors, and rocking entertainment. If you’re a fan of the arts and Broadway, consider the Epcot International Festival of Arts. The above suggestions are just a few of the great things you can do with Disney — and we barely mentioned Disney beyond the parks. Think Hawaii, Europe, Asia, Africa and River Cruising — Disney does that, too! Tricia Scott is owner of Visit Mickey Vacations, the exclusive travel planners of Northeast Ohio Parent magazine. For a free quote, go to visitmickey.com/quote-neoparent.